First Round : Ernie Els and Ben Curtis shared the lead at 4-under 68. Eight players trailed by one. Second Round : Justin Rose, Curtis and Stephen Ames sat at 7-under 137, one ahead of K.J. Choi, Fred Couples and Els. Todd Hamilton was two back. Third Round : Els moved to 12-under 204, two ahead of Couples, Choi and Rose. Tiger Woods and Ames were three behind. Missed Cut: Arjun Atwal (77-76-MC), Jonathan Byrd (80-76-MC), Alex Cejka (78-73-MC), Ben Crane (78-75-MC), Luke Donald (78-72-MC), Nick Flanagan (78-73-MC), Fred Funk (75-75-MC), Robert Gamez (77-73-MC), Mathias Gronberg (70-71-MC), Charles Howell III (71-78-MC), Thongchai Jaidee (72-79-MC), Jonathan Kaye (78-72-MC), Hank Kuehne (75-74-MC), Justin Leonard (74-76-MC), Mark O`Meara (72-82-MC), Joe Ogilvie (74-77-MC), Rod Pampling (79-71-MC), Bo Van Pelt (76-75-MC), Craig Perks (74-76-MC), Joey Sindelar (76-73-MC), Heath Slocum (74-77-MC), Brandt Snedeker (75-74-MC), Kirk Triplett (75-77-MC), Bob Tway (73-80-MC), Lian-wei Zhang (77-77-MC), Duffy Waldorf (76-80-MC), Steve David Edwards (W/D), Elkington (W/D), Dudley Hart (W/D), Andre Stolz (W/D). Weather: Thursday, a mix of sun and clouds with temperatures in the mid-70s and some higher winds. A little cooler and cloudier on Friday and Saturday. Similar conditions on Sunday with temperatures a touch warmer. 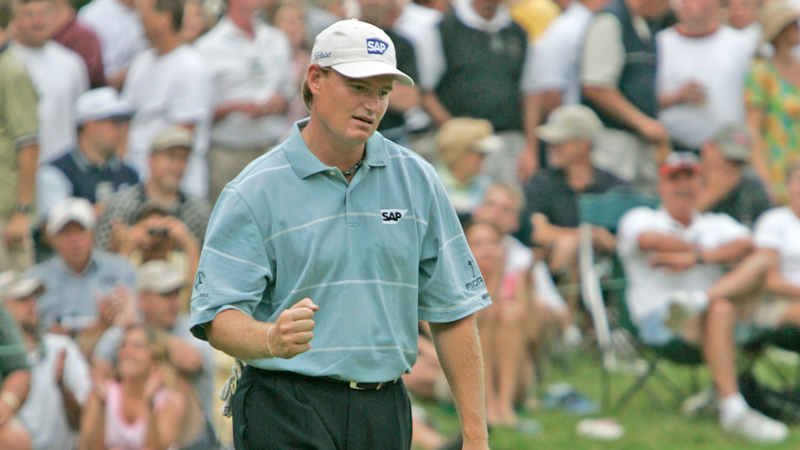 On Sunday evening at the 2004 Memorial Tournament, Ernie Els capped a nearly flawless weekend by making birdie at the 72nd hole to card a second straight round of 6-under 66 to win his first Memorial Tournament by four strokes over Fred Couples. Els, who began Sunday at Muirfield Village Golf Club with a two-stroke lead, held off an impressive leaderboard that included Couples, Tiger Woods, Justin Rose, and K.J. Choi to earn his 14th victory on the PGA TOUR. Els, the South African native with 3 major championship titles coming into the 2004 Memorial, became only the fourth non-American winner in the 29-year history of the Memorial Tournament. Els also became the first player in Memorial Tournament history to hold at least a share of the first-round lead that went on to win the event. Though Els had a great ball-striking week, there was no question as to what facet of his game won the tournament for him - putting. "I made almost every putt that I had to make," said Els, who took only 100 putts in the four rounds, a new Memorial Tournament record. "It/s tough to call just one a key putt." Though Els won by four strokes, the final round was much tighter than it appears by glancing at the final results. Els dropped out of the lead with a bogey at the par-3 fourth, while Couples chipped in for birdie at the same hole to take a one-shot lead at 12-under, marking his fifth chip-in for birdie or eagle of the Tournament. Els responded by making birdie at the next hole to join Couples in the lead. Moments later, a charging Tiger Woods joined the pair at 12-under after he birdied holes 4, 5, and 7. Woods run ended there, as he could only par-out from that point forward to finish at 12-under. Els and Couples continued to battle back and forth on the back-nine, with Els taking a three shot lead after the 10th hole and Couples fighting back to within one shot after back to back birdies at the 11th and 12th holes. Though Couples would stay close, he never caught Els, who began a barrage of clutch putts starting at the 12th green after Couples made his birdie. Els made a 10-footer at the 12th hole to save par and keep the lead. He followed it with a 30-footer on the next hole to regain his two-stroke lead. Els made a 15-foot par putt as part of a terrific up-and-down at the par-3 16th to maintain a two-stroke lead with two holes to play. Both men birdied the 17th giving Els a two stroke lead going into the final hole, where Couples made bogey and Els rolled in his birdie putt for a four shot victory. Couples knew there was little he could do the way that Ernie was playing. "I was right there the whole time," said Couples. "That's a great feeling for me. I was second, but lost to the best player by far. He just turned it on during the back nine." Els also acknowledged that he played about as well as he ever has on Sunday at the Memorial and that he couldn't be happier. "It means a lot. It's not quite like any other tournament," said Els after his victory. "It's got a little more prestige to it, especially with Jack Nicklaus as the host. And if you look at the winners roll, there has been quite a few great champions. I'm just so happy the way everything finished off."